Urien has such strong genetics behind him, it is no surprise that we are pleased with his conformation and fiber package … Augusto, Snowmaster, Incaaccoyo Star. Urien has the same pleasant demeanor of his dam, Princess. 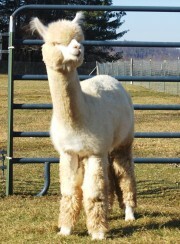 His color is unique and has been described as champagne and pearl. 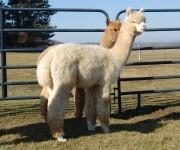 The judge described Urien’s as stylish with great coverage and conformation and praised his bright, buttery fleece. He has good conformation, frame and bone. 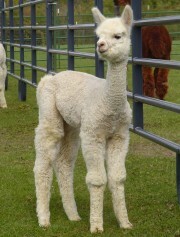 In a recent fleece show the judges notes said his fiber had exceptional brightness with good character and density, placing behind the Judge’s Choice male alpaca from the halter show. In the most recent fleece show he placed 3rd out of 14 behind his class’ color champion and the Judge’s Choice for the show. Plus he was awarded Best Crimp! 2010 Empire Fleece – Best Crimp!